Founded in 1834, Wake Forest is the nation’s premier collegiate university, balancing the personal attention of a small liberal arts college with the breadth and depth of a large research university. Undergraduates can choose among 41 different majors. Strong graduate programs in arts and sciences, nationally ranked schools of law, business and medicine, and a growing divinity school, enhance the undergraduate experience. Wake Forest is proud to have partnered with the Stamps Family Charitable Foundation in offering the Stamps Scholarship since 2013. 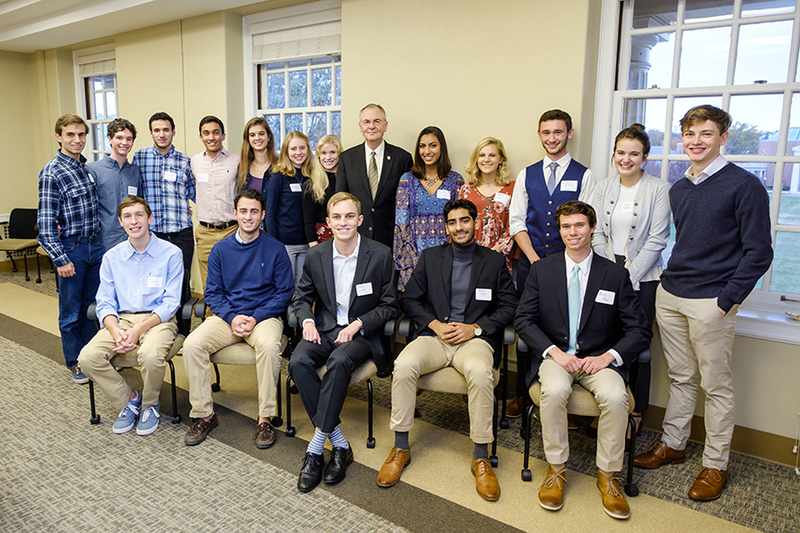 Wake Forest now awards about ten Stamps Scholarships to each entering class. As a full cost-of-attendance award, the Stamps award will be in the top tier of merit-based scholarships at Wake Forest. The University is grateful for the opportunity to work together with Roe and Penny Stamps and the Stamps Family Charitable Foundation to provide life changing educational experiences for outstanding students. The Stamps award will open doors of opportunity to deserving students who demonstrate superior academic achievement, a high degree of intellectual curiosity and scholarship, and exceptional promise in leadership, service and social responsibility. Enrichment funds are available to support activities outside of the classroom. These activities should have independent research value and may be used for such purposes as international travel for academic independent study or research, undergraduate research internships, unpaid internships (e.g. with a nonprofit organization), or attending academic or co-curricular conferences. The Wake Forest application process is designed to be a personal experience – one where applicants provide insight into their educational achievements, academic motivation, maturity and character. We want to get to know the applicant and discover what each individual could bring to the campus community. The Wake Forest application requires an essay and short answer writing, giving students an opportunity to be expressive in ways other than transcripts and test scores. A personal interview is encouraged, either during a campus visit or via Skype. This past year 77% of entering freshmen ranked in the top 10% of students from their respective schools with regard to academic achievements. While Wake Forest does not require SAT or ACT scores, they may be submitted for consideration. Admissions counselors do look closely at a student’s high school qualifications: GPA, class rank, and strength of course load, discovering many talented students—students with excellent high school credentials – who may not be strong standardized test takers. Making the SAT/ACT scores optional has removed a barrier, encouraging more talented students with strong high school performance to apply, knowing that their SAT score will not hurt their chances for admission. Please visit our admission website for more information (http://www.wfu.edu/admissions ). Wake Forest is honored to be affiliated with the Stamps Family Charitable Foundation and is grateful to receive funding that will continue a tradition of support for outstanding students. To read more about the Stamps Scholarships at Wake Forest, click here.